Copies the document from the document library to the specified URL. You can copy the document to another document library cross-site, to another site collection or to another folder. SourceUrl The URL of the document to be copied. You can use full URL as well as domain relative URL. We would recommend to use constants from the workflow context. DestinationUrl The URL where the source document will be copied. You can use full URL as well as domain relative URL. We would recommend to use constants from the workflow context. SiteUrl The URL of the current SharePoint site. This property defines context of the workflow action. All actions performed by workflow action will be executed on specified SharePoint site. If this property is blank it will use current SharePoint site by default. Moves the document from the document library to the specified URL. You can move the document to another document library cross-site, to another site collection or to another folder. SourceUrl The URL of the document to be moved. You can use full URL as well as domain relative URL. We would recommend to use constants from the workflow context. DestinationUrl The URL where the source document will be moved. You can use full URL as well as domain relative URL. We would recommend to use constants from the workflow context. File Url The URL of the file to be removed. You can use full URL as well as domain relative URL. We would recommend to use constants from the workflow context. It copies the document set from the document library to the specified URL. You can copy the document sets to another document library cross-site, to another site collection or to another folder. SourceUrl The URL of the document set to be copied. You can use full URL as well as domain relative URL. We would recommend to use constants from the workflow context. DestinationUrl The URL where the source document set will be copied. You can use full URL as well as domain relative URL. We would recommend to use constants from the workflow context. If the url ends with slash '/' the document sets will be placed in this folder without name changes. Otherwise the Document set will be renamed. 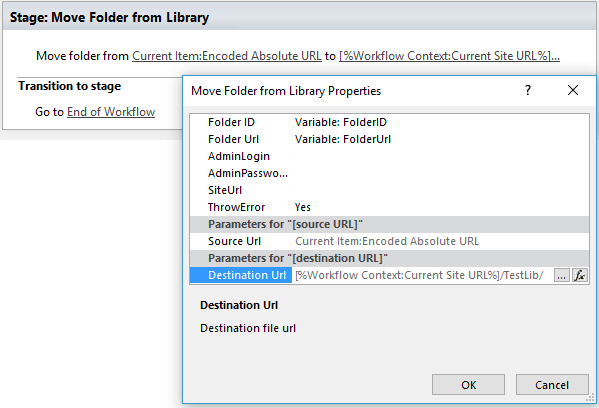 It moves the document set from the document library to the specified URL. You can move the document sets to another document library cross-site, to another site collection or to another folder. Folder Url The Url of the folder. If you specify full path, you can create several folders. Creates a new folder in the document library or list using the specified path. Target List Url The URL of the library of list where the folder will be created. You can use full URL as well as domain relative URL. We would recommend to use constants from the workflow context. Folder Url The URL of the library where the source folder will be removed. You can use full URL as well as domain relative URL. We would recommend to use constants from the workflow context. 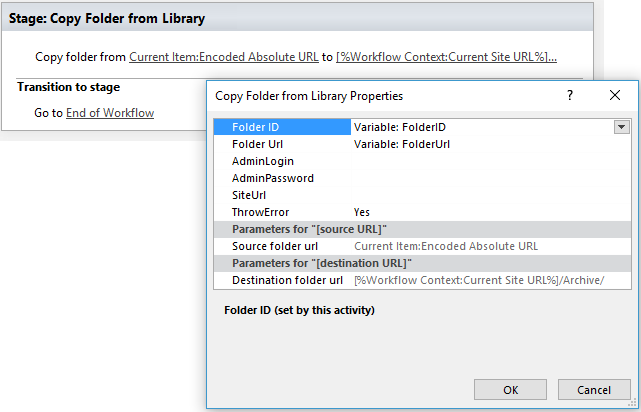 Copies the folder from the document library to the specified URL. You can copy the folder to another document library cross-site, to another site collection or to another folder. Source folder url The URL of the folder to be copied. You can use full URL as well as domain relative URL. We would recommend to use constants from the workflow context. Destination folder url The URL of the library where the source folder will be copied. You can use full URL as well as domain relative URL. We would recommend to use constants from the workflow context. Moves the folder from the document library to the specified URL. You can move the folder to another document library cross-site, to another site collection or to another folder. Check-in the document at the specified URL with the specified comment. Check-out the document at the specified URL.